According to a new market report published by Transparency Market Research , “Tire Pressure Monitoring System Market - Global Industry Analysis, Size, Share, Growth, Trends, and Forecast, 2018–2026” is expected to surpass US$ 8 Bn by 2026, expanding at a CAGR of more than 4% during the forecast period. 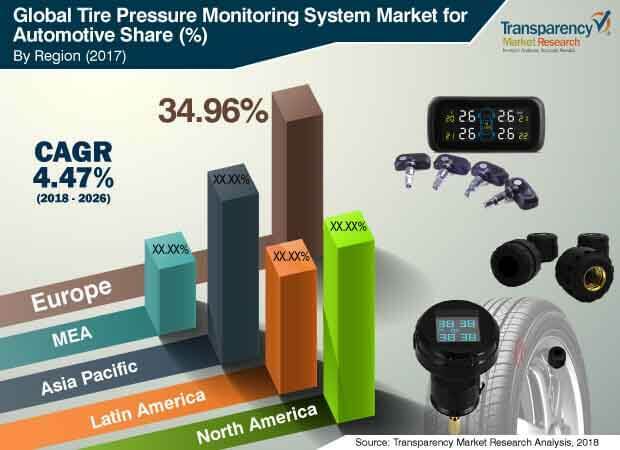 The global tire pressure monitoring system market for automotive is projected to expand at a CAGR of more than 4% between 2018 and 2026, according to a new research report by Transparency Market Research (TMR). According to the report, the global market is likely to be influenced by a range of political, economic, social, technical, and industry-specific factors. Latin America is likely to witness rapid rise in demand for tire pressure monitoring system, with the market in the region anticipated to expand at a CAGR of about 7% during the forecast period. Vehicle tires functioning below the prescribed inflation level place the complete performance of automobile and the safety of passengers at danger. The tire pressure monitoring system of the vehicle assists in increasing safety on the highway by enhancing the vehicle’s motility, decreasing its braking displacement, reducing the wear of tires, and enhancing fuel economy of the vehicle. The direct tire pressure monitoring system segment accounts for a majority share of more than 75% of the market. The direct tire pressure monitoring system takes help from sensors fitted inside the assembly of tire to transmit information about tire pressure to the vehicle’s computer. It is the simplest and more accurate method used to monitor tire pressure, as compared to that utilized in the indirect method. Consequently, the direct system has significant penetration in the market. The conventional tire pressure monitoring system segment dominates the market. Easy availability and cost-efficiency are key factors responsible for the higher share held by the conventional tire pressure monitoring system segment, as compared to the intelligent tire pressure monitoring system segment, of the market. The passenger vehicles segment held more than 70% share of the global market in 2017. Tire pressure monitoring system is an additional safety feature provided in the vehicle. Majority of OEMs provide this feature as optional in passenger vehicles. The U. S. is home to a significant number of with commercial vehicles, and the tire pressure monitoring system is mandatory in all vehicles in the U. S. Therefore, the commercial vehicles segment held a relatively higher share of the tire pressure monitoring system as compared to the vehicle production ratio of commercial vehicles and passenger vehicles. In terms of volume, the OEMs segment is likely to lead the market, as most OEMs, such as GMC and Ford, provide the vehicle with safety features, such as tire pressure monitoring system. The segment accounted for more than 60% share of the market, in terms of volume, in 2017. The tire pressure monitoring system has a lifespan that is almost one-third to that of the vehicle, i.e., three to four years. The tire pressure monitoring system can only be replaced when there is fault in the technology, or the tires are replaced, as per consumer’s choice. Consequently, the replacement of tire pressure monitoring system is rare. In terms of region, the global tire pressure monitoring system market for automotive can be segregated into Asia Pacific, Europe, North America, Latin America, and Middle East & Africa. The global tire pressure monitoring system market was dominated by Asia Pacific, and held more than 33% share, in 2017. The penetration of tire pressure monitoring system is low in Asia Pacific; however, the region dominates the global market due to large production of vehicles. Development in the dimensions of tire pressure monitoring system, advancement in the materials and use of such materials to fabricate the components of tire pressure monitoring system, improvements in procedures utilized in the production of tire pressure monitoring system, and usage of highly developed designs of tire pressure monitoring system are powering the technological development of the tire pressure monitoring system for automotive. The global tire pressure monitoring system market for automotive is highly consolidated as conceptual design and manufacturing of the tire pressure monitoring system needs significantly high precision, expertise, innovative technology, and high investment. Furthermore, the tire pressure monitoring system market for automotive witnesses the existence of key producers working in the industry for several years. Majority share of the tire pressure monitoring system market for automotive is held by global players, as they dominate the R&D for tire pressure monitoring system. Major players operating in the global tire pressure monitoring system market for automotive include Valeo, Robert Bosch, ZF Friedrichshafen AG, Continental AG, Sensata Technologies, Inc., Denso Corporation, Pacific Industrial Co., Ltd., NXP Semiconductors, WABCO, Huf Hülsbeck & Fürst GmbH & Co. KG, NIRA Dynamics AB, Bendix Commercial Vehicles Systems LLC, Dunlop Tech GmbH, Hamaton Automotive Technology Co., Ltd., Bartec USA LLC, and ATEQ.